According to the German government’s new energy concept that was recently introduced, renewable energies shall replace fossil and nuclear energy sources step-by-step. The offshore wind energy sector plays a key role in this new energy strategy, and shall contribute the major share of renewable energy to the future German energy mix. 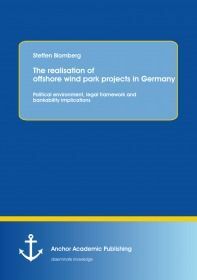 The purpose of this study is to examine and evaluate the applicable conditions that have to be considered by project developers and investors when realising an offshore wind park project in Germany. Firstly, it analyses the political environment for the offshore wind energy sector in Germany. Secondly, it gives an overview of the most relevant German legal statutes determining, inter alia, the establishment of wind energy priority areas, the applicable German feed-in tariff scheme, and the necessary approval process for offshore wind parks to be erected in the German exclusive economic zone. Thirdly, those potential bankability issues and financing challenges are discussed that an offshore wind park project planner might be exposed to when trying to secure a debt financing for such a sophisticated and capital-intensive project.